Sarah Nader - snader@shawmedia.com Crystal Lake Central's Liam O'Donnell warms up during wrestling practice Wednesday, Jan. 10, 2018. O'Donnell has been wrestling with a torn ACL in his knee all season. He suffered the injury during football season and missed almost the entire season. Rather than have surgery to fix the injury, he elected to wait until after wrestling season and wrestle through the injury. 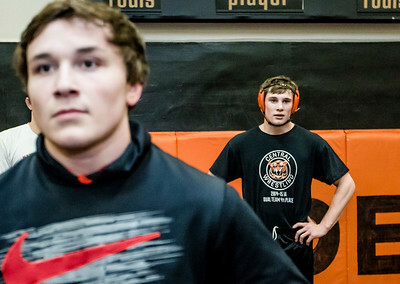 Sarah Nader - snader@shawmedia.com Crystal Lake Central's Liam O'Donnell (left) and Seamus O'Donnell listen to the coach during wrestling practice Wednesday, Jan. 10, 2018. Liam is wrestling with a torn ACL while his twin brother, Seamus, just returned from a torn bicep injury. Sarah Nader - snader@shawmedia.com Crystal Lake Central's Austin Parks (left) wrestles Seamus O'Donnell during wrestling practice Wednesday, Jan. 10, 2018. O'Donnell just returned from a torn bicep injury. 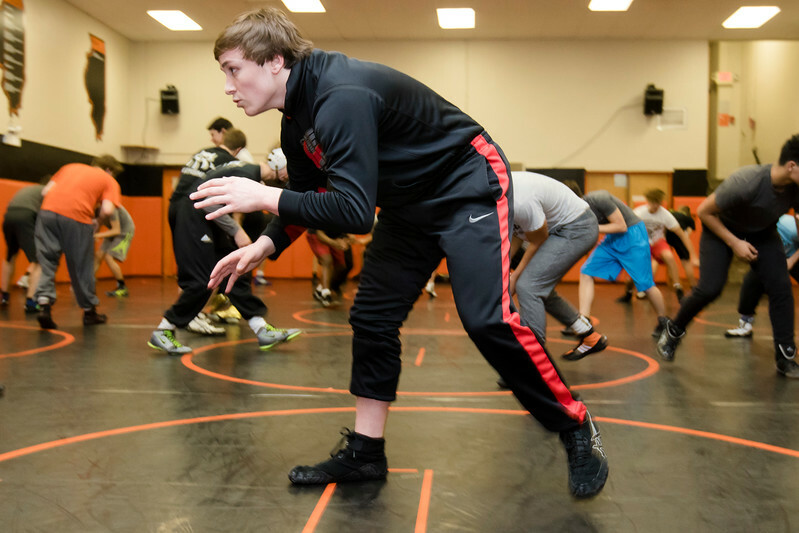 Crystal Lake Central's Liam O'Donnell warms up during wrestling practice Wednesday, Jan. 10, 2018. O'Donnell has been wrestling with a torn ACL in his knee all season. He suffered the injury during football season and missed almost the entire season. Rather than have surgery to fix the injury, he elected to wait until after wrestling season and wrestle through the injury.